My son is a lot of things. If I had to describe him I would use the words kind, friendly, sensitive, passionate, hilarious, strong and busy, very very busy. Some would say boisterous, in fact many do. And whilst it’s a term I personally try to avoid, I don’t take offence when he is described this way. In many ways, my son is boisterous, as he is kind, friendly, sensitive, passionate, hilarious, and strong. But I often find it an attribute focused on more than others, and sometimes people can really say the most insensitive of things. And I know they don’t mean it, it’s normally coming from another parent who has a very placid child, parents with the child who grew out of it (at age 2 *eyeroll*), and even parents with really young ones. I know they are just trying to comfort me in a situation that they themselves might struggle with, or are even genuinely a bit curious about what it’s like. But sometimes, what they say stings. Like really stings. How on earth do you cope? Urgh, yes I’ve had this comment a few times, and I know you mean that I’m essentially super mum for wrangling this busy kid of mine and keeping him occupied 24/7. But it’s not coping, I enjoy chasing my son around, finding out what keeps his attention and just being around him really. Does he ever sit still? He does, but only in front on a screen. Did I have grand plans of sitting down and doing hours of craft with my child? Sure I did. But that’s not his thing, not right now anyway. He will sit and watch TV for hours though if we would let him, and some days we do (I know, controversial!). But he is much happier when he is moving, and that’s perfectly okay! If you just walk away, he’ll follow you. He doesn’t, he’ll keep going. He’s not running away, he’s got a plan and I need him to explain the plan to me so I can work out how to keep him in proximity, or you know follow him if it’s important enough to him… But thanks for the parenting advice lady I’ve never met before. Sometimes, they just need a good smack on the bum. It’s always strangers who come out with this one, and it’s often for the oddest things, like the time my son wouldn’t keep his hat on at the park… Smacking is not a tactic used in my household, but ah, cheers? Is he always like this? This is probably the one I struggle with most. I never know what to do with it. Always like what? This is who he is, and I actually wouldn’t change a thing about him. My son is perfect to me. Don’t get me wrong, I know he is not perfect. But I adore every little thing about him, even the bits that are more challenging than others. 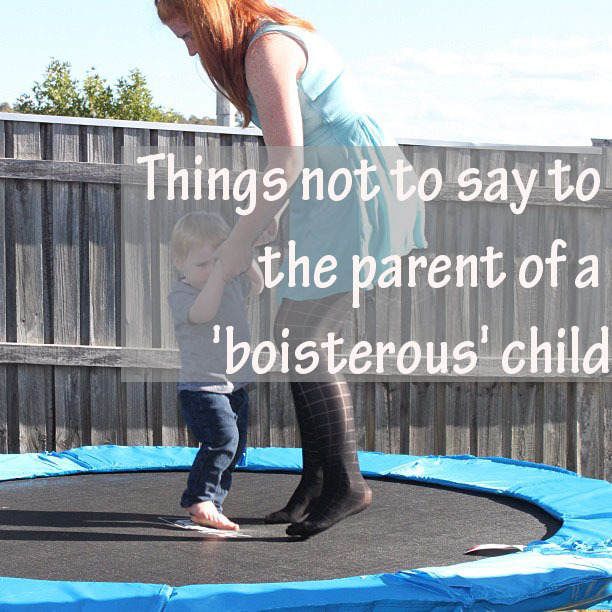 And yes, having a boisterous child can be more challenging in certain situations than in others, just as I’m sure having a shy child or a sensitive child can be. But it is a part of him and I would never wish it away. Does your child have a certain personality trait that seems to be discussed more than others? Any tips on what not to say to you? This entry was posted in Parenting and tagged featured.